B.E. 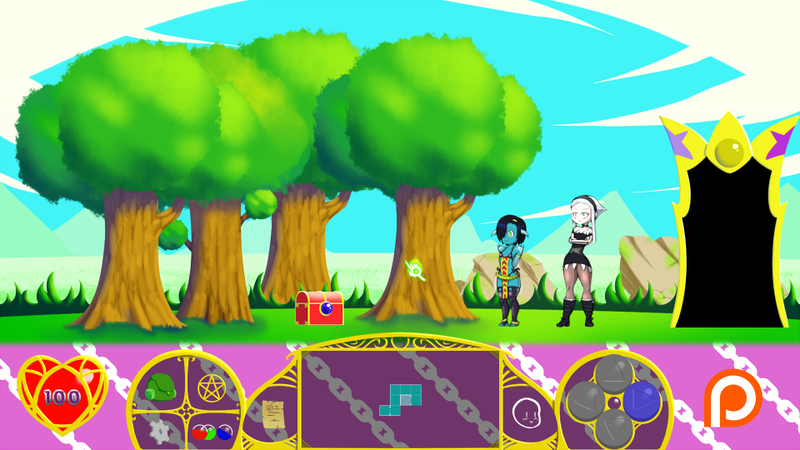 Witches is a game in which you can explore a mysterious world filled with dungeons and secrets, fight monstergirls in a unique type of battle that mixes puzzle, RPG and shoot'em up elements, create items and spells through the use of alchemy. Every monster you fight can join you and, by leveling your characters enough, you can rank them up which changes their appearance. Taking inspiration from several games of the dungeon crawler genre such as Darkest Dungeon or Etrian Odyssey, exploration in B.E. Witches will take the form of a 2D sidescroller in which you can move from room to room to find treasures and ressources, which will help you fight stronger monsters. In B.E. 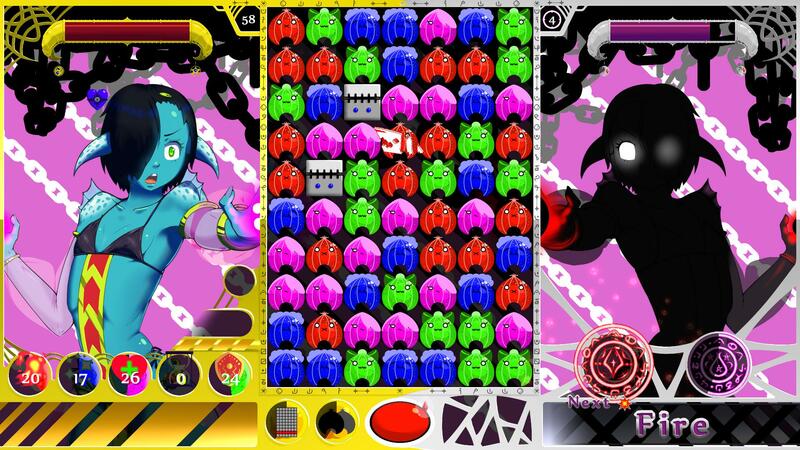 Witches, the fights are a mix of puzzle game and RPG with a pinch of shoot'em up. Line up blocks of the same color to obtain mana, which you can use to cast spells. Take too long however, and your opponent will attack you and summon heart eaters, demons that will attack your cursor until you get rid of them. All of this amounts to a high tension kind of battle that requires you to react quickly to an ever changing situation. Many items, accessories, spells and more can be created through alchemy, as long as you have the required ressources and recipes. Once you do, alchemy takes the form of a special, simplified battle. Clear it, and the result will be synthesized! Last but not least, the rank system will allow you to make your characters stronger if they have leveled enough, along with a slight change in appearance. There are 5 different ranks for each characters! Please continue to develop this game, I thoroughly enjoyed the demo and would totally pay money for a full version! Take a look at the readme I included in the game folder, it contains a link to some drivers you might be missing. Hard to believe that the goblins were easy-peasy but the weird beige girl was constantly healing and I couldn't beat her! Still though, I can see very much potential for this game. (Add sum more boobies, though!) It reminds me of Deep Space Waifu it the way it incorporates fun gameplay with 18+ content. Lastly, I made a vid of my gameplay. Enjoy. Thanks! It was very interesting to see you learn how to play, though I guess I should make it more obvious that you don't have to select adjacent blocks, and that you can select more than 2 at once as well. The mud elemental heals all the time but has low HP, meaning you can easily overwhelm her by casting 3 or 4 fire spells at once. Also yeah, there will be many more boobies. are there still updates coming to this game?? Yes there are! It's taking a bit of time since I am working on it alone, but I'm making progress little by little. The next update will be a big one, but I can't say exactly how long it will take for now. Well I can't say much about this game... IT'S AMAZING!!! The art style is beautiful and I can't get enough of the fast paced, on the edge of my chair game play! You are doing great on what your doing and I would love to support it in anyway! Well then again just a small request can you make the area a little bigger? It would be even better roaming around like a 20 tile area! Thank you so much! This is still a very early version of the game, which is why there are so few rooms with not too much to do in them, but I plan for the areas to be waaay bigger in the final game. There will be more monstergirls, more heart eaters, more blocks, more spells... Better everything, pretty much. I'm allocating as much of my time as I can to the game, and I'm hoping to have a big update ready in a few months. I've also added a few links at the beginning of the itch.io description in case you want to know more about B.E. Witches. You know I've always wanted to have a conversation with a game dev. But I know your very busy with all your crap and stuff like that, heck I tried having a conversation with a Youtuber but she was way too overwhelmed by her friends that she didn't really want to speak with me because it would be cringe like or something? Anyway I would and if possible WILL do anything to give in support. I would love to be one of your patreons or something but since I don't have a credit card and well if I used someone else's then they would be very confused why they're giving money to someone who is making a game about monster girls with huge breasts and butts. But if there is anyway possible I can contribute to improving the game. I would gladly help. Well since you are so adamant about helping me (thank you! ), I guess I do have some trouble when it comes to spreading the word about B.E. Witches. Maybe you'd have some suggestion? Let's not continue this discussion in the comments however, you can send me a mail at nosebecc@gmail.com, or a pm on Patreon or whatever. How can i get a new monster girl? I'll add more in future updates, and each one of them will be recruitable. Sadly I don't have as much time I can spend on B.E. Witches as I would like, so I can't say when exactly this will happen. Probably in a few months, but don't hold me to that. Nice game play can be fast or slow rilly fun game keep up the good work man! You can't in this version, as saves haven't been implemented yet. Yeah, this seems to be the #1 issue right now. There is a "how to play" .pdf, but making an in game tutorial will be one of my top priorities when I get time to code again. second : Once stunned, the heart eater's core will be visible (red gem surrounded by a white circle). Just left click inside the circle and the heart eater will die, damaging your opponent in the process. The best way to defeat self healing monsters is to gather as much red mana as possible. 60 red mana is a victory, but it's possible to defeat it with less by using combos and killing heart eaters. It's not a bad start but a control guide would be greatly appreciated. Yeah I need to work on a tutorial, the game feels a bit overwhelming right now. Level 4 is actually the last level in this demo, and yeah, I didn't realise how hard it was at the time. This demo is actually pretty outdated by now, I'm working as hard as I can to have a new one ready by november which will give a better idea of how the game is going to work as a whole, not only the fights.